Amazon founder Jeff Bezos is making rapid progress on his plan to leave all of us poor suckers behind on this godforsaken planet, and he plans to start selling tickets for suborbital space flights in 2019. On Friday, a new report claimed that the right to be a Blue Origin guinea pig will cost £150,000 to £226,000. That price range is right in line with what Richard Branson’s long-delayed Virgin Galactic service has been charging for its own planned suborbital flights. According to Wired, Branson has sold 700 seats at $250,000 (£189,000) apiece. And as with Virgin’s service, the sale of tickets does not mean Blue Origin will get off the launch pad with humans on board in 2019. 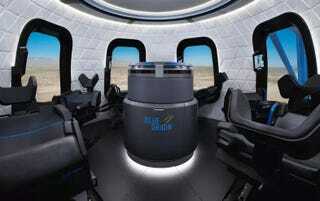 No humans have flown on the eight test flights of Bezos’ New Shepherd capsule, and three sources told Reuters that the first passengers will likely be Blue Origin employees.